A pilot project set to launch in Plymouth aims to help refugees use memories of home to build a new life, and address negative attitudes to immigration at the same time. ‘Creative Recovery: Mapping Refugees’ Memories of Home’ will work with volunteers from Plymouth’s growing refugee community. Through one-to-one meetings and creative group workshops, participants will be encouraged to share recollections, as well as concrete objects like diaries, photos and home videos of everyday life in their countries of origin. Using this raw material, and with training in experimental digital mapping and 3D modelling techniques, the 15 volunteers will create exhibits that will be put on display at a public event during next year’s Refugee Week in June. These will range from drawings and audio-visual material, to digital maps and models of their former homes. As local people visit the exhibition or find out about the project, they can learn about participants’ experiences of home and homemaking, and the differences and similarities with their own lives. A report on the project will also be circulated to organisations working with refugees in Plymouth and further afield, such as the Red Cross, local housing associations, the city council, local MPs and the Home Office. University of Plymouth Lecturer in Architecture Dr Sana Murrani is leading the project, which she is undertaking in partnership with the British Red Cross, Plymouth branch. She points to the rapid demographic shift in the city, following Plymouth’s designation in 2002 as a dispersal centre for asylum seekers, as proof of the urgent need for a project of this kind. In 2002, two per cent of the Plymouth population were from ethnic minority backgrounds. By 2011, this had risen to nearly ten per cent, and it is still rising. “This rapid, poorly resourced increase in ethnic diversity has greatly impacted many already low-income local communities in a region unaccustomed to immigration. Negative attitudes to immigrants are therefore widespread, occasionally extending to hate crimes, and exacerbating the challenges of recovering a settled sense of belonging through a flourishing home life that reflects their cultural heritage. 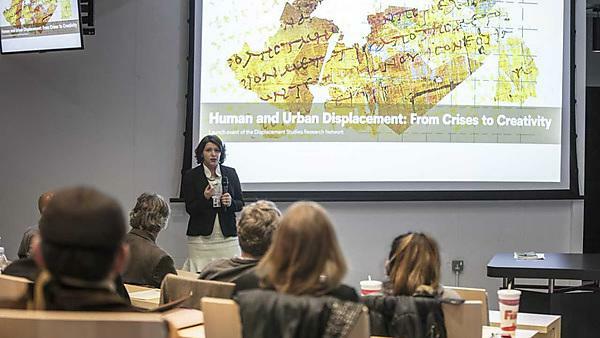 “Refugees face daunting personal and collective challenges when they are forced to leave their homes, but most initiatives have tended to focus on surviving the immediate crises of transit. The Iraqi-born academic is the co-founder of the Displacement Studies Research Network based at the University of Plymouth. Part of the network’s work involves thinking about how to make research a collaborative effort between academics, practitioners and marginalised people. ‘Creative Recovery: Mapping Refugees’ Memories of Home’ was one of just 31 projects awarded a grant from the European Cultural Foundation's Courageous Citizens 2018 programme, out of more than 500 applications from across the world. DSRN seeks to provide a voice for the displaced and facilitates a platform for research projects with our global partners. We are dedicated to collaborative partnerships with displaced communities, and to tracing, responding to, and informing relevant policy and practice.